Wanting to celebrate Christmas in July but don’t know how? 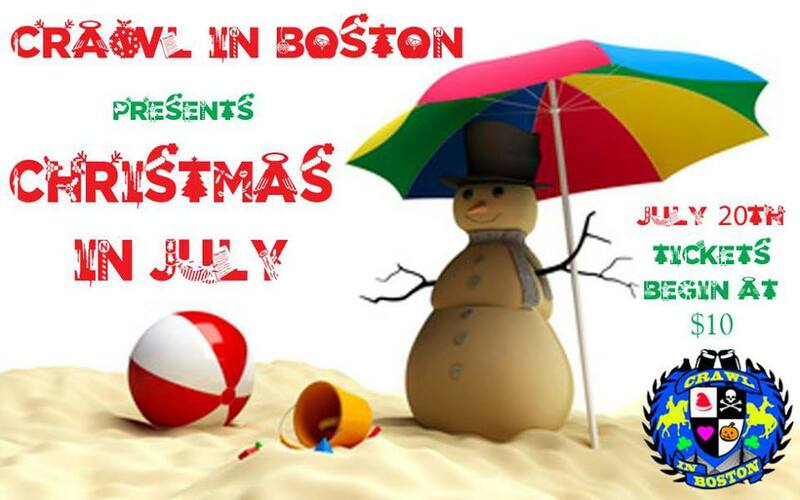 Why not join a pub crawl with Santa and his little helpers in Boston in July? You might just see Rudolph playing with the others in their reindeer games. This as also a great summer date idea, so don’t miss out on all the fun! You can purchase your ticket here. Here is the continued series from MC Slim JB. Adventurous Date: Drinks on the Waterfront, water taxi to dinner in Eastie, water taxi back to the Seaport, nightcap in Fort Point. Pick a night from Thursday to Sunday (my restaurant choice is closed Monday to Wednesday) when you anticipate clear weather. If you want to start the evening on a swanky note, begin with a pop at the Alley Bar at Rowes Wharf, the new patio bar at the Boston Harbor Hotel. (Don’t confuse this with Downtown Crossing’s similarly-named Alley Bar, a gay hangout.) The specialty cocktail list at this breezy outdoor bar features refreshing, summery long drinks like the Alley Cat (vodka, mint syrup, lime and cilantro). If you’re in the mood for something more casual, have a quick one at Biddy Early’s Pub just across the Greenway at the edge of the Financial District, a dumpy, loud after-work joint with big, cheap drinks. Then walk to the dock behind the InterContinental Hotel a few doors down from the Boston Harbor Hotel and summon a City Water Taxi to Stop #11. Take it to the East Boston Harbor Shipyard & Marina (Stop #68), and tell the captain you’re headed to KO Pies; you’ll get a nice discount off the fare. This short, romantic boat trip features absolutely stunning views of the Boston Waterfront. At the other end, walk through a real, working commercial shipyard to KO Pies at the Shipyard, a rare outpost of Australian cuisine in Boston. The food here is nothing an American will find challenging, just fresh and nice-priced snacks, salads, sandwiches. Be sure to get at least one Aussie pie, a small pot pie with a terrific pastry crust and fillings like curried chicken or beef stew, and maybe get a beer, too. These are best enjoyed at the outdoor picnic tables. Hail your return City Water Taxi, but this time, debark in the Seaport at Stop #8, at the Barking Crab. The Seaport is an undeniably hot dining and drinking destination these days, but most venues there are dull chains or tourist traps, middling and overpriced. You can do better: take a quick stroll down the Harborwalk, hugging the Fort Point Channel on your right (away from the Moakley Courthouse, toward South Station). Then take a left down Congress Street at the Boston Children’s Museum’s giant milk bottle and proceed a couple of blocks to Tavern Road. This hopping new gastropub has a cool industrial vibe, very good desserts (like housemade ice cream sundaes and cookies), and a fantastic bar program: just the place to put an exclamation point on your evening.